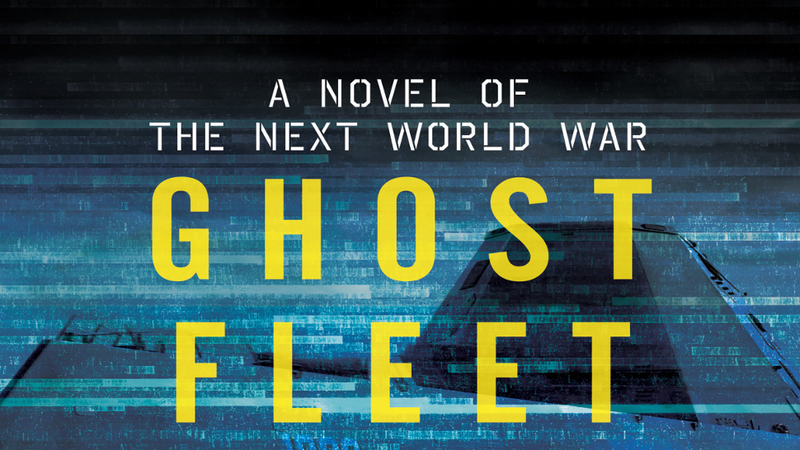 Set in the near future, Ghost Fleet dares to imagine what the next global war might actually look like. We talked to P.W. Singer to learn how he and his co-author August Cole managed to produce a futuristic techno-thriller that’s as plausible as it is entertaining. We were also given an exclusive excerpt from the upcoming novel you won’t want to miss. Peter W. Singer and August Cole are known for their extensive work as defense analysts. Singer is a strategist at New America and a consultant for the U.S. military, the intelligence community, and Hollywood; Cole is an Atlantic Council non-resident senior fellow and a former defense reporter who uses fiction to imagine future wars. In Ghost Fleet — a scifi thriller set for release on June 30 — Singer and Cole portray a future conflict in which the United States is pitted against an expansionist China. Both sides refrain from a nuclear exchange, instead opting for a “hot war” that features an array of futuristic military technologies, from robots and drones through to cyber attacks and brain hacks. But given the backgrounds of the authors, it’s fair to say this is no ordinary thriller. Every trend and technology portrayed in the novel is based in reality — so much so that the U.S. military has already taken notice. Indeed, the book features 374 individual citations spanning 23-pages of endnotes. Make no mistake, however, this is no technical slog — it’s a highly readable and engaging thriller that sets a new standard for techno-thrillers. We spoke to P. W. Singer to learn more about the project, how it was put together, and what their story can tell us about the future of warfare. Singer was kind enough to provide io9 with an exclusive excerpt of the scene. Sechin’s eyes darted around the room. He tried to turn his head, but he couldn’t move. A computer display in front of him was all that he could see; the screen showed a surgeon drilling into a shaved skull. A puff of bone dust smoked up from the metal boring through the skull on the screen. Then the screen itself was covered with a fine white powder that wafted in from behind him. His vision blurred as some of the powder fell in his eyes. He tried to blink but couldn’t. Someone outside his field of view squirted a liquid into his eyes and dabbed the corners as the liquid dripped out. A second and third time, the drill bored through the skull on the video screen, sending more puffs of bone dust wafting over. He wanted to close his eyes to stop watching, but he couldn’t. After the second squirt of liquid into his eyes, he realized it was because his eyelids were no longer there. He couldn’t do anything, in fact, but watch as the surgeon began to insert thin fiber-optic wires into the three holes in the skull. He knew the wires were filled with over five hundred electrodes, each as thin as a human hair, that would link with the electromagnetic signals of his brain’s neurons. The surgeon, if one could call him that, then disappeared from the computer screen. Sechin heard the sound of metal wheels scraping on the tile floor, coming closer. Then the surgeon was there in front of him, pushing a cart with a small box on top, fiber-optic wires stretching out from it and wrapping around the back. Also on the cart were two robotic hands; other wires linked them to the box. Sechin knew who the man was even before he removed his surgical mask. “General Sechin, it is a pleasure to meet you.” Dr. Qi Jiangyong stood with the practiced upright posture of a university lecturer, which he had been before his neuroscience research had led him to be reassigned to the Public Security Ministry. Sechin didn’t reply; he was trying to take his mind elsewhere, lock his thoughts away in a place of complete intensity beyond, just as they’d taught him in training. He thought of Twenty-Three’s touch, losing himself in the exact moment of his imagined release. He felt Twenty-Three’s breath hot on his neck, then blowing slightly in his ear; his body spasmed. Suddenly Sechin was thrown back in the moment, and he noticed the two metallic hands in front of him moving, as if caressing something that was not there. The two hands stopped their rhythmic motions and then tried to reach out. The fingers stretched, grasping, their attempt to strangle Dr. Qi futile, as the robotic hands each ended at a wrist affixed to the cart. Qi then began a lecture he had given hundreds of times, first to his students, then to the Directorate officials who had paid for the research, and now to his subjects. It was as much a ritual as a requirement that he felt obliged to follow. He still felt the desire to teach even as he learned. Sechin could only watch as the two hands before him balled up into fists, clenching in anger. The fists unballed and just hung in the air. Sechin again tried to lose himself in thoughts of Twenty-Three, in his mind running his finger along her tattoo. The hands began caressing something in the air. Dr. Qi paused and dabbed a cloth over Sechin’s forehead, blotting the beads of sweat that had gathered just above where his eyelids had once been. Sechin tried to focus on Twenty-Three but found that he couldn’t pull up her memory. Then he felt himself wanting to move the robotic hand. But why? He didn’t want to move the hand. Half of Sechin’s brain tried to focus on Twenty-Three, her breath, her skin, her hair, anything, while the other half seemed to want only to move the fingers on the right hand and then the left. Sechin watched as all of the fingers on the robotic hands began to wiggle, his mind now simultaneously telling them both to move and not to move with all his focus. Ghost Fleet is scheduled for release on June 30, 2015. More information on how to order here. Contact the author at george@io9.com and @dvorsky. Top image is the book cover, designed and illustrated by Brian Moore and Nick Kaloterakis.